Personal Finance Center helps track and manage personal expenses, plus provides an estimated credit score. MySpendingPlan.com is free secure online personal finance budgeting software that can help you manage your spending to save money and help empower you to reach your financial goals. 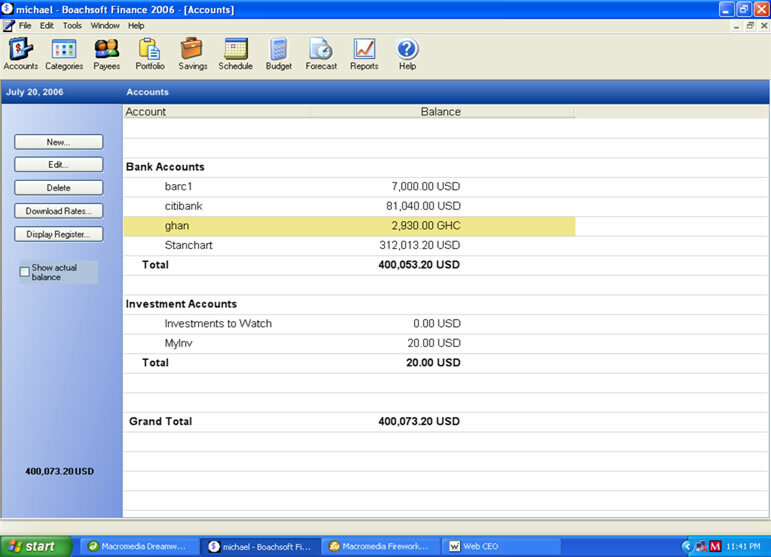 Account Xpress Lite is a personal finance management and budget planning software loaded with features designed to help you manage your money quickly and easily. Know where your money goes and stay in control with Account Xpress Lite. Personal Finance Quizzes is a free Windows program that can help you get acquainted with terminology used in personal finance and investment. Includes quizzes on Home Financing, Stocks, Bonds and Mutual Funds. Comprehensive portfolio management and technical analysis system for individual investors. Manages investments in stocks, bonds, cash, other assets & liabilities. Creates over 30 reports and charts. Downloads price updates from the internet. Easy to use calendar based application for managing and organizing personal finances.